This answer to was the common play in Edo-period Japan, and throughout the old development in China. It was played much less in the twentieth century. It has been making something of a comeback in the twenty-first. The ideas involved are different from those with the other extension responses. White takes into account that Black might take a big corner with one more play here. White a is therefore played early. Otherwise White b is reasonable; tenuki is also a major option. 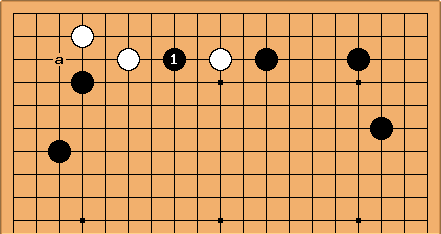 White at c was the old Chinese play, now effectively obsolete. In this case the slide with isn't seen in high-level play. 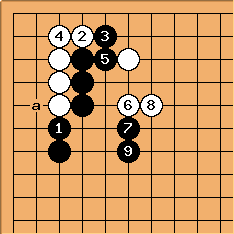 With present, Black's stones are more efficiently placed. 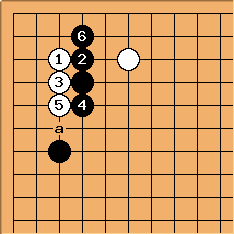 What was acceptable to White when Black's extension was to a is here unacceptable. In many recent games the 3-3 invasion has gone this way. Black plays to deny White's hane, rather than at a. It could be that both players are satisfied with this kind of result. The stone is weak but not closely confined. White's main choice comes right at the beginning. White could play the hane of immediately. This will weaken the white stone, but solidify her corner, so she needs to take less trouble to live there. 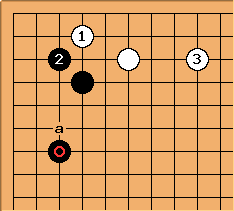 After , the joseki usually ends. 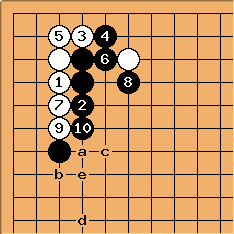 White has a as her main follow-up, black b. 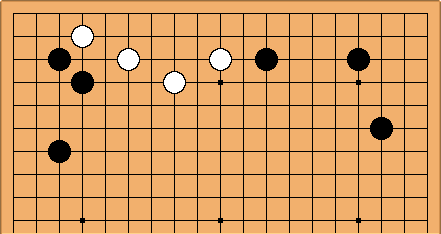 Black can also choose to take sente and allow White to connect up with the marked stone. 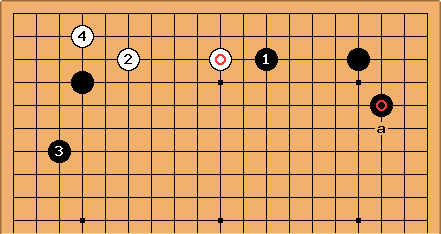 White can also push up once before playing the hane. Now Black has no choice but to stop the connection. 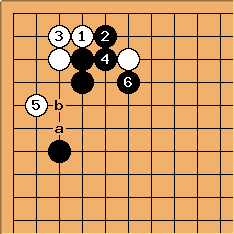 After , White will usually cut through and fight with White a, Black b, White c, Black d (or another point, depending on the position on the left side), but she can also play tenuki, and keep this cut as aji. 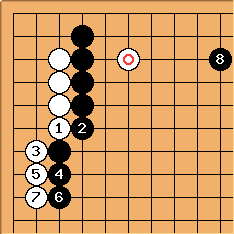 If Black wants to stop it, Black e makes correct shape. 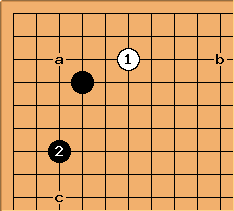 instead of is also joseki; although in recent years is more common, is still played often. After this sequence, the white corner lives (black can play at a and connect in sente, but this is just large endgame), and White can therefore play and to establish a position with her single stone. 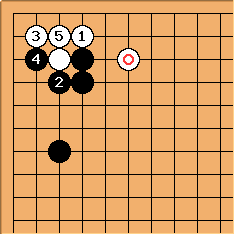 Black is thick towards the left side; whether he has a chance to attack on the upper side depends on the position. This has been, well, an orthodox development of the orthodox fuseki over recent years. White slides at despite . This is seen especially in case the enclosure is the large low enclosure, with moved to a. In fact it is normal for Black to invade at here immediately, rather than answer at a. This interpretation is a manifestation of a basic principle of framework theory: it is an advantage to build a strong group on the edge of the opponent's framework.